�����With Gold surpassing the $1,300 mark again, dealers are already reporting an increase in activity. 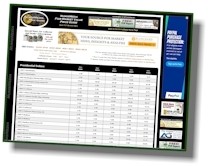 Buy prices are climbing and customers are showing renewed interest. Not only have common Mint State MS60 to MS64 Twenty Gold coins (both Liberties and Saints) increased $30+, the MS65's are up at least $70, showing a restored confidence in short term direction. As long as Gold holds above $1,300, most dealers feel that trading will continue to rise and fuel a new bull market. Considering the fact that Gold was under $1,200 less than a month ago, a 10% increase in bullion has done wonders for the confidence of buyers and sellers. 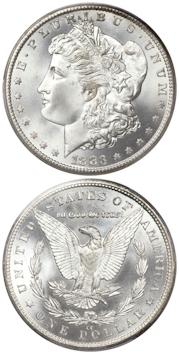 �����Morgan Silver Dollars are one of the most widely collected coins in numismatics. Their design, size, and history of the old west captures the hearts of thousands of collectors. Over the past few weeks we have reported a drop in the value of the most common dates. The generic coins tend to follow the price of Silver and, with the metal falling under $20 an ounce, thousand dollar bags of VG Dollars have drifted to $26,550. Even the MS64�s have fallen to $66 Market this past week. 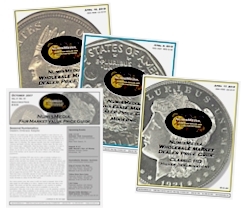 �����However, activity for Morgan Silver Dollars has not slowed; buyers are taking advantage of this downturn and sales are brisk for dealers who participate in this market. Not only are the common dates trading, better to rare dates are extremely steady at current levels. Listed below are some of the Morgan Dollars that have advanced in the last couple of weeks. 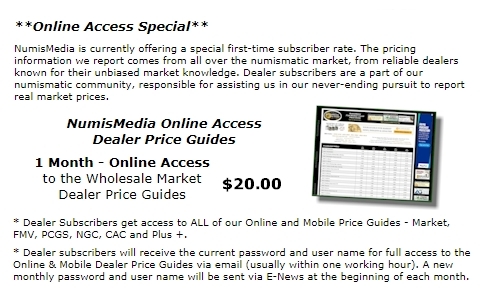 �����This week�s advances in the LD Wholesale Market Dealer Price Guide are led by Buffalo Nickels, along with Indian and Early Lincoln Cents. �����Buffalo Nickels have been discounted for quite some time but it looks like collectors are now comfortable with current levels to get back in the market. The 1913 D TII in MS66 is up to $1,950 Market and the 1913 S TII in MS65 is higher at $3,075. Also listed higher is the 1923 S in MS64 at $1,150. �����There are numerous increases for Indian Cents this week. The 1859 Copper Nickel in MS65 is at $2,775 Market, and the 1877 in MS64 BN is now at $4,800. �����Early Lincoln Cents are very active in MS64 and higher, especially the coins from San Francisco and Denver. The 1909 S Red in MS66 jumped to $2,250 Market, while the 1912 D Red in MS64 advanced to $600.